It's been more than a year since Samsung released its Android powered Galaxy Camera. And despite our initial skepticism, we were actually impressed that the merger of a mobile device and point-and-shoot camera was so well executed. The weird thing was wonderful, and according to Samsung, it sold pretty well! Which is why the Galaxy Camera 2 is only a lightly modified version of the earlier success. The Galaxy Camera 2's biggest improvements are faster, more powerful guts. The new model has a quad-core 1.6 GHz processor and 2 GB of RAM up from a dual-core 1.4 GHz processor and 2GB of RAM. In terms of actual performance, we'll have to wait and see what those extra cycles and memory translate to. I had the brief opportunity to play with the Galaxy Camera 2, and it seemed pretty snappy, in particular, when transitioning from the TouchWiz Android UI to the camera interface. We didn't compare it to the performance on the previous model, but I remember some lag here. The camera's battery capacity has been increased from 1650 mAh to 2000 mAh, which should help keep the camera humming despite the extra power requirements. On the surface, the camera's imaging guts haven't been improved: It appears to have the same 16-megapixel 1/2.3-inch BSI CMOS sensor and 21x optical zoom as before, but according to Samsung executives, the camera's image processing engine has been overhauled so we can expect better image quality. Additionally, the NFC to make Wi-Fi pairing with tablets and smartphones easier. This is pretty standard on connected cameras these days, so it's not all that surprising. You'll also notice a sleeker, slimmer looking design. Don't let it fool you, the camera is almost exactly the same size. 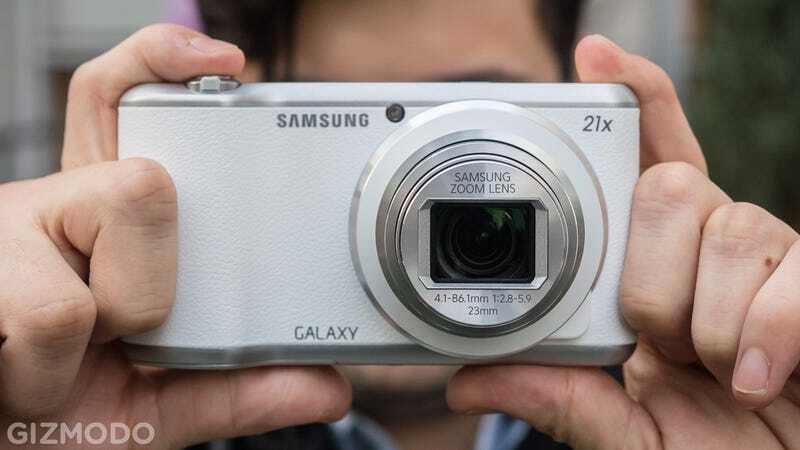 All in all, Samsung's Galaxy Camera 2 is essentially the same offering as before. Even if the camera turns out to be a lot faster than before, it's still going to appeal to exactly the same type of person who found the original attractive: People who want to be able to take pictures with a point-and-shoot and post them to Instagram or Facebook just as easily as if they were using a phone. Indeed, it's for people who want a franken-camera. So here it is. Pricing and availability have yet to be announced, but expect something similar to the Galaxy Camera's ~$500 price tag. As before there will be Wi-Fi only and carrier models.